How does a Crooked Stave sour ale stand up to cellaring? Take their 2012 Crooked Stave Oculus Dexter No. 1 and hide it away for 10 extra months and imagine what a little time will do for this beer. I wanted to see how this beer would stand up. 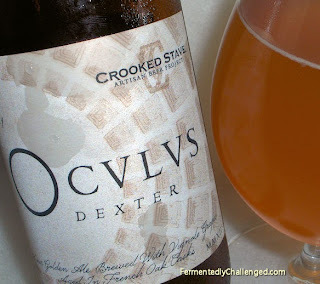 Crooked Stave put out Oculus Dexter #1 back in late 2012 as part of their Cellar Reserve Membership and sold these bottles primarily to members. This is billed as a sour Golden Ale that was brewed with Vignole grapes and aged in French oak casks. The beer ended up at 8.9% ABV and was put into 375ml bottles. I was given 2 bottles as part of the membership. One to open now in August 2013 and another to wait for perhaps another year. In a way, I'm glad Crooked Stave didn't just put this into a larger 750ml bottle, because I now wouldn't have more for later. Let's open it up! Appearance: Oculus Dexter poured out a bright golden color. I poured it cold around 40 degrees so it could sit and warm up a bit. Being cold, the brew was just slightly hazy, but with no visible sediment in the glass. There wasn't much of a head at all to this beer, even with an aggressive pouring. What little head there was (1/2 a finger tall) was bright white. A small white ring clung to the top of the brew and around the glass. Swirling the beer yielded just a hint of lacing. As the beer warmed, the brew cleared. Aroma: I love surprises. And when I get to smell a sour ale I never know just what to expect. Oculus Dexter had a very sour and tart aroma with a wine-like hit of white grapes. The malts in this brew gave off a toasted aroma, while the French oak imparted some classy wooden overtones. The aroma was quite full and powerful. Just a hint of alcohol crept through as well. For a sour lover like me, this was quite intriguing and tempting. Taste: The first sip of Occulus Dexter hit me with a sharp acidic tartness. The sour factor was definitely boosted up on this beer, probably on a scale of 8 or 9 out of 10. The tartness seemed to hit the tip and middle part of the tongue as well as the roof of my mouth. It was tangy, with a lot of funky twangs, yet had a sweetness and wine-like quality from the grapes. If beer and wine could be blended into one, this would be the beer to do it with. There's nothing light about this beer. It had a full bold mouthfeel, a puckering tartness and a great crisp and sour finish. Overall: Cellaring this beer for nearly an extra year didn't hurt this beer at all. It was just as good or even better than I had expected it to be. Sure, a bit of the carbonation may have gone out, but the big flavor of this biting sour beer was amazing. As a sour beer lover, this beer gets high marks from me. So far I have been quite impressed with what Crooked Stave has put out, both in their taproom beers as well as their membership beers. If you have a chance to try this beer from last year or in the future - definitely seek this out! 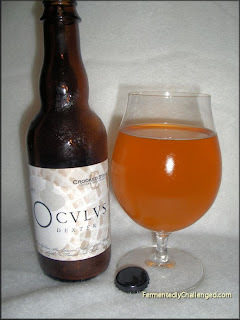 Disclosure: I paid for this beer as part of my Cellar Reserve 2012 Membership from Crooked Stave Artisan Beer Project.